In 1993 The European Commission proposed transport corridor project named TRACECA (Transport Corridor Europe-Caucasus-Asia) the Black Sea and the Caspian Sea crossing to Europe-Caucasus-Asia. In the same 1993, in the European Commission session held in Helsinki was also proposed another corridor "North-South" besides TRACECA. The Russian Federation is the initiator of creating "North-South" Transport Corridor, which in 1999, June – July presented a preliminary version of the draft agreement to India and Iran. Approving the idea of creating the corridor, the latter involved in the development of technical standards. According to some experts, the idea of building a canal through the territory of Iran "The Caspian Sea / Gang-e-Enzeli - Persian Gulf / Bandar-e-Emam Khomeini" may become a major boost for the creation of the corridor, as for a number of countries it will be a direct and shortest way to the Persian Gulf and the Indian Ocean. 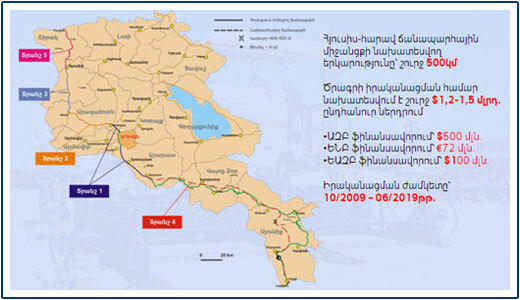 As a result of theses mentioned developments, on September 12, 2000 within the framework of Eurasian 2nd International transportation convention on transport issues held in St. Petersburg the outline agreement about the "North-South international transport corridor" was signed by the authorized representatives of the Government of the Russian Federation, the Government of Islamic Republic of Iran and the Government of India. Agreement’s depositary state is the Islamic Republic of Iran, which has already created a preliminary Secretariat. Republic of India - India's ministry of Land Transport (Maritime Department) and the Indian ministry Commerce and Industry (Department of Commerce). Competent bodies of the founding members have created Coordinating Board which is the main body of the Agreement, for the implementation of the questions relating to this Agreement. The objectives of the agreement are as follows: develop transport relations, ensure the availability of access to global markets, increase the exchange of passenger and cargo volume, to ensure their safety, coordinated transport policy framework and create the necessary laws and regulations, ensure equal conditions for transport services. Members of the Agreement should workload in the territory of their country within the period of goods transferring for the reduction of terms and cost as well as the transit of goods and passenger’s documentary - Patent facilitation and on for the equalization.